It’s beginning to look a lot like Christmas … everywhere you go (sorry, I couldn’t resist!) One of the things I get most excited about at Christmas is the wonderful mood people are in (except at the malls) and the general feeling of goodwill toward all. Even typically cranky people tend to lighten-up during the festive season. I know I’m sounding all Polyanna over here, but let me live in my little corner of Pleasantville for a while, won’t you? There are some sweet and tender television specials that capture this spirit quite nicely. Check here for suggestions:Canada, US. And there have certainly been some memorable holiday movies: check here for the ten best holiday movies of all times. But in our house, the tales of Christmas have been mostly enjoyed through books. We have of course covered the classics, but I was surprised to find some new favourites published in more recent years. Because every child is different and each of these books weaves a wonderous tale, they are not ranked. Simply presented to inspire you to head out to the library or book store and start sharing these stories with your children. Love or hate the newer tradition of the Elf on the Shelf, the book is quickly becoming a classic. Beautifully illustrated, based on the tradition that Carol Aebersold started with her own family in the 70’s, the elf watches children during the day and reports back to Santa each night during the holiday season. The elf usually is found in a different place each day after returning from the North Pole. This beautifully illustrated book meant for infants and children in preschool encourage children to thank God. A mama polar bear and her cub go through a series of simple questions and answers, and through these questions, they reveal the true meaning behind Christmas. 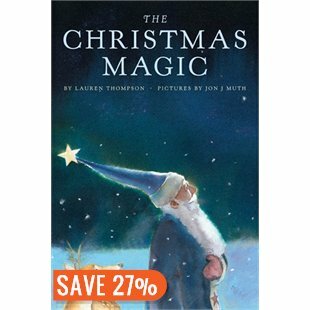 This is a great book if you wish to teach your child about God and why December 25th is so special. Everyone’s favourite pig, Olivia, is all set to help during the holidays. Olivia is ready to help with making cookies, wrapping presents, and more, but it’s a lot harder than she thought. Olivia tries to make it the best celebration ever, and she may be somewhat overzealous at times. Kids familiar with the Olivia series will enjoy the simple and familiar illustrations. A story of inspiration for children who have felt excluded. This timeless bestseller tells the story of Joshua, a lamb with a crippled leg. The story beautifully demonstrates God;s love for those who feel alone and different. Joshua felt left out because he wasn’t able to run and play like the other lambs. God reveals a very special plan for Joshua’s life and the little lamb’s prayers are answered in an amazing way. 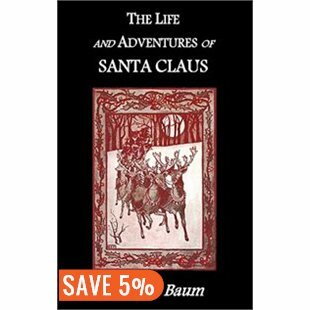 In this book written more than 100 years ago, Baum invents a complete back-story for Santa Claus. He explains the origins of Santa Claus and the Christmas traditions that surround him. 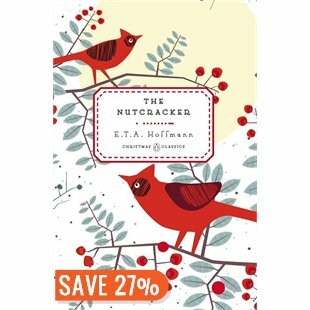 The enchanting story is set in a fantasy world of fairies, elves, gods and talking animals, where Santa learns to whittle small toys from wood. He later makes it his mission to make children happy, bringing about such traditions as hanging stockings by the fireplace and flying reindeer. This new edition includes all Mary Cowles Clark’s original illustrations in black and white. This wonderful book by Eric Carle features a farmer who works hard all day, caring for his animals. One night he has a dream about snow covering everything. When he awakes, he finds that his dream has come true. The colourful collage-like illustrations will delight young children. This one should be on your list if you are a fan of The Hungry Caterpillar. Mortimer goes in search for a new home because his current mouse hole is cold and unpleasant. On his journey, he comes upon a nativity scene and decides that this might be a good home. He then hears humans outside telling the story of baby Jesus, and he is unsure if this is the place for him. 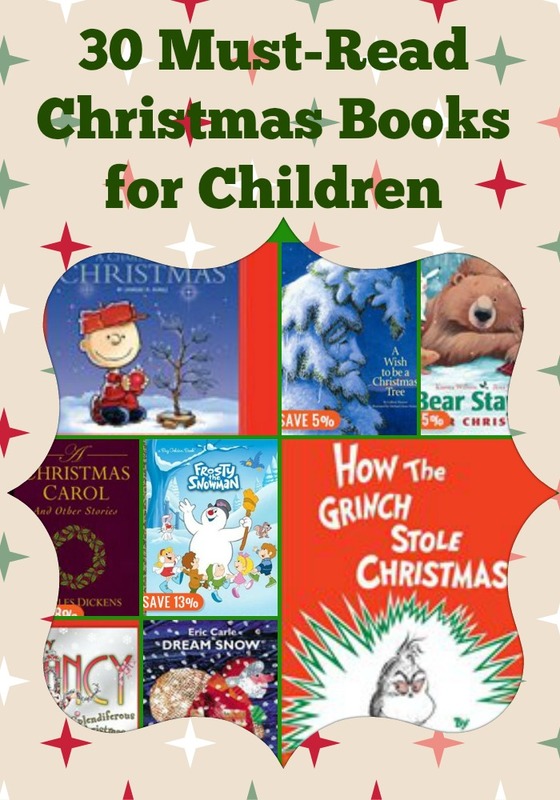 This book presents the true meaning behind the holidays in a fun way. A small evergreen tree alone in the forest, wishes someone had chosen it to take home and decorate for the holidays. Animals ‘friends’ approach and tell the tree how special it is to them. They proceed to decorate the tree with things from the forest, and the tree soon realizes that not being chosen was the best thing after all. A little red mitten appears in the forest and the animals don’t know what it is. They soon realize that it’s cozy inside the mitten, so one by one they crawl in. The mitten stretches to accommodate each animal. Who knows how many animals will fit? The book features colourful and detailed illustrations. Olive is a little dog with big aspirations. She is enjoying the celebrations, but thinks that the song about a reindeer is about her! She thinks “All of the other reindeer” is actually, “Olive the other reindeer.” She is then convinced that she must be a reindeer, not a dog. Olive sets out to become a part of Santa’s team. This one is sure to elicit giggles! If you are a fan of Bear and friends, you will love this book. The animals of the forest want Bear to experience the holiday season. Everyone knows that bears hibernate all winter, but they proceed to wake him up. Bear bakes sweets, hangs stockings, and celebrates with all of his friends. There’s a fun twist celebrating friendship with Bear planning a special surprise of his own. The illustrations in this one are my personal favourites. If you’re looking for something quirky, this might be the book for you. Based upon the popular movie by Tim Burton, The Nightmare Before Christmas puts a scary twist on the holidays. After a successful, spooky, and fun Halloween, Jack Skellington starts thinking about other celebrations. Everything becomes clear when he discovers Santa Claus, the magic of presents, and decorated trees. Expect a healthy dose of freakish presents and a skeleton dressed in Santa Claus clothes for this spooky holiday (new) classic! Dickens timeless holiday story featuring Ebenezer Scrooge…need I say more? Growing up, we used to eagerly anticipate A Charlie Brown Christmas special, so this book makes the list for purely nostalgic reasons. Charlie Brown sets off on a quest to uncover the true meaning of Christmas with Snoopy, Linus, and the entire Peanuts gang. Another eagerly anticipated Christmas special growing up. I have to admit, it’s still my all-time favourite. The book, the TV special, the movie. They’re ALL fabulous in my eyes! If you don’t already own a copy, run out to the bookstore RIGHT NOW! Classic Seuss rhyming with a heartwarming message. Perfection. This special anniversary edition has bonus commentary, footnotes, and archival images. In Whoville, everyone celebrates the holiday with much joy and happiness. That is everyone except the Grinch. His heart two sizes too small, he dresses as Santa and steals Christmas…literally! Dr. Seuss beautifully illustrates that the holidays are much more than presents and food. The story of one boy who steps onto a magical train that heads straight to the North Pole where he meets Santa Claus and learns what it really means to believe. Elves, reindeer, Santa Claus… If you haven’t seen the movie, you may wish to add that to your list as well. Written in 1816, The Nutcracker captures the wonder of a child at Christmas. Marie receives a nutcracker as a gift from a mysterious uncle on Christmas Eve. That night, the nutcracker comes to life and defends her from the Mouse King, and takes her to the Kingdom of Dolls. A true classic, this one has to be purchased as a board book *my rule*. There are many versions of the favourite Christmas poem ‘Twas the Night Before Christmas by Clement Clarke Moore. It is filled with everything Christmas, from dancing sugarplums to flying reindeer. What adult doesn’t know this poem by heart? In this classic tale, a little girl is unable to go home until sh sells her last bundle of matches. She lights matches one by one to keep warm. With each match, the girl’s reality dissolves into visions of light and warmth, each vision more beautiful than the last. In this version illustrated by Jerry Pinkney, the nineteenth-century Danish girl of Andersen’s tale is transformed into a child from current-day, highlighting the invisibility of the poor among the rich; a story as common today as in Andersen’s day. This book tells the story of one man’s attempt to get a tree into his house. To big to fit through the door, Mr. Willowby must snip off the top. The rest of the story explains the fate of the top of the tree. This timeless tale shows us all that it doesn’t always matter what you give, the simple act of giving makes a difference. This book is a visual delight. The classic Christmas hymn is illustrated by Thomas Kinkade, the Painter of Light. A classic tale of the wisest gifts of Christmas. Husband and wife, Jim and Della each makes a sacrifice to give each other a special gift. Della sells her long, beautiful hair. Jim, makes a sacrifice no less difficult. The magic of the stories starts from the despair they feel after exchanging gifts on Christmas Eve. They realize that the true gifts of Christmas are all around them, not in any store. This is a love story for all time. This is the story of the magic of Santa. He prepares for Christmas Eve, gathering his reindeer, feeding them, polishing his bells and his sled, choosing toys for every child in the world. Then, with magic that makes reindeer fly, he spreads Christmas joy throughout the world–now and always. This is an autobiographical story by Truman Capote. The story explores the loving bond between a young boy and an older woman as they celebrate the season and each other’s company. If you have enjoyed the rest of the “If you give…” series, you will really appreciate this book. Mouse is back with a bunch of holiday fun. If you take a mouse to the movies, he’ll ask you for some popcorn. When you give him the popcorn, he’ll want to string it all together. Then he’ll want to hang it on a Christmas tree. You’ll have to buy him one… Addictive, right? Nursery magic is strange and wonderful and only those playthings that are old and wise and experienced like the Skin Horse understand. Toys–and people–become real through the wisdom and experience of love. Love Fancy Nancy? Then you must add this book to your collection. Nancy is excited to decorate the Christmas tree. She bought a sparkly tree-topper with her very own money. But when things don’t go as planned, will Christmas still be splendiferous? Expect all the usual Fancy Nancy sparkle! The original song was written by Robert L. May in 1939. Rudolph the Red-Nosed Reindeer is one of the most (if not THE most) catchy Christmas tune. Fall in love all over again with the youthful reindeer buck who has an unusual luminous red nose. Cheer as Rudolph saves Christmas and is finally accepted by his fellow reindeer. Just like the Night Before Christmas has to be a board book, Frosty the Snowman has to be a Big Golden Book picture book. Based on the timeless holiday classic Frosty the Snowman, the Big Golden Book stays truest to the iconic TV special. Frosty, the most magical snowman in town, is most famous for his cheerful disposition. I personally enjoy the book more than the TV special (which I find just a little creepy). Look at Frosty go! A graduate of the MBA program at York University, Leslie pursued a career in Marketing and Communications for over a decade before leaving that world behind to become an entrepreneur. She is the creator of Ottawa’s uber-cool family entertainment and edutainment company Funatorium Exploriumfollow. She has always loved to write and started freelance writing for local Ottawa publications about three years ago. She writes about family, food, travel, and also dabbles in copywriting. Her dream is to retire as a travel writer … who wouldn’t want those perks! She is mom to an amazing son and wife to a pretty terrifc guy. She is a perpetual idea generator and believer of all things good in the world.